Hallooo! I’ve been away much longer than I expected to be. A couple of weeks ago, I was in Korea; this past week I’ve been dealing with jet lag, a freak storm that dropped six inches of snow, two sick kids, etc. I was desperately feeling the need for a “reset.” On Friday morning the most amazing, miraculous thing happened, which helped me do just that…I’ll write about this on Monday. Today I’m republishing one of the very first posts I put on this blog, because it will give you some background for Monday’s post. (Oh, and if you want to read Part 1 of this post, you can find it here). It would be reasonable to assume that given my long and checkered past with pet ownership, I might have taken a break from animal husbandry during my four years at Dartmouth College. That logical assumption would be based on the faulty supposition that I myself am a rational human being. 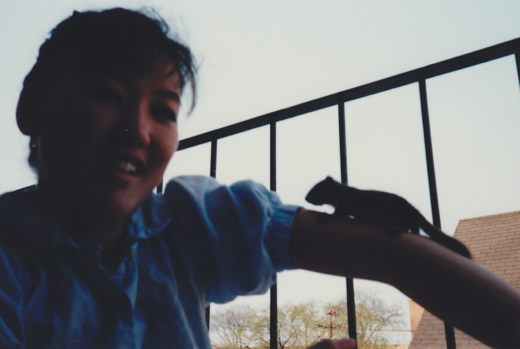 When a friend of mine discovered an orphaned baby squirrel at the base of a tree and brought him over to my apartment, I was utterly entranced, and threw myself headlong into the project of rehabilitating him. Basil the squirrel ate everything I fed him with great gusto. To make sure he wasn’t eaten with great gusto by my roommate’s two enormous cats, I put him in a sock and took him to all my classes. And thus Basil the squirrel not only received free room and board, he also received a free Ivy League education. I conscientiously supplemented the college lectures he attended on Russian literature with some more practical training. Every day I would take him out to a tree and encourage him to climb it. The first day I put him on the tree he remained frozen in place, trembling and peeing uncontrollably. He was only too glad to come back home with me in his sock. So that he could practice his tree climbing skills at home, I found a big branch and periodically put it and Basil out on our fire escape landing. My roommates’ cats tracked his every move from the other side of the screened window with keen interest. Once I glanced out the window to check on him and was horrified to discover that he had disappeared. I ran down the stairs and checked all around for an injured baby squirrel on the ground underneath the fire escape. He was nowhere to be found. I could only assume that he had fallen to his death and was then eaten by one of the tribe of inbred, six-toed, cross-eyed feral cats that prowled around our parking lot. With a heavy heart I climbed the stairs back to my apartment. My upstairs neighbor met me in the stairwell. “Is this your squirrel? !” she asked me, handing Basil over to me. 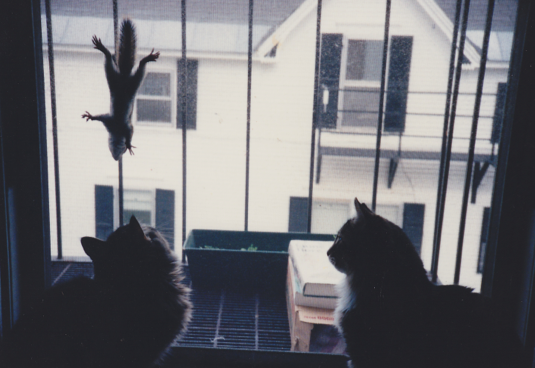 Unbeknownst to me at the time, squirrels are able to scale brick walls. He had climbed up to the next fire escape. My neighbor had stepped out of the shower and had gone to open her window, still wrapped in a towel. As soon as Basil spotted her, he took a flying leap and landed in her cleavage. Every day I took Basil to his tree. Every day he climbed a little further up the trunk, and took a longer time to return when I called him. One day I lost sight of him in the branches. I craned my neck searching for him and called him over and over again. Finally, blinking back tears, I decided this must be good-bye. A few days later I sat wistfully at my desk by an open window. “Born Free” was ringing in my ears. Just as I was about to burst forth into lusty song to join my voice to the swelling internal chorus: “..as free as the wind bl—“ I could hear someone urgently calling my name. Another neighbor, who lived on the other side of the parking lot had just rescued Basil from the jaws of one of the wild cats. I ran down. As soon as Basil saw me coming towards him he streaked across the gravel lot, ran up my leg and torso until he reached my shoulder, and there he sat, boldly scolding and taunting the cats. After a few days I let him go back to his tree, and it really was good-bye. I never saw him again. 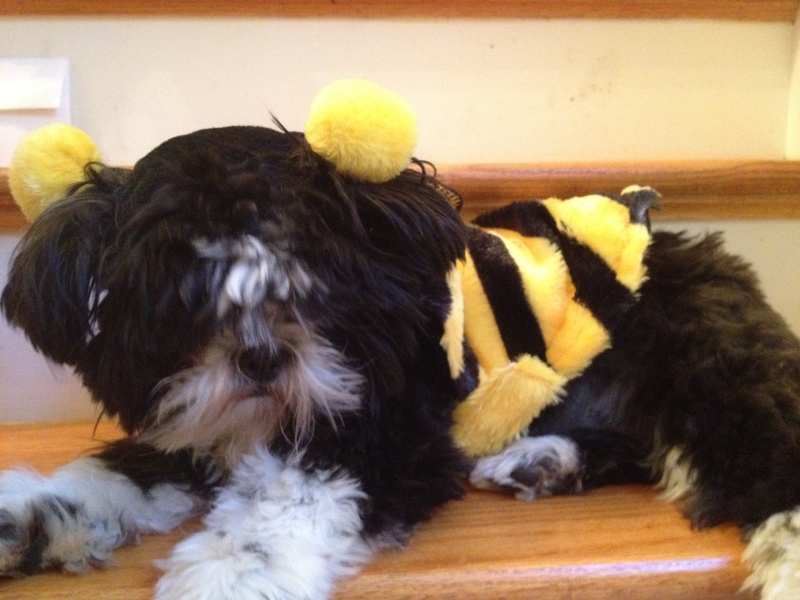 This “nonsense piece of fluff,” as my dad called him, was so implausibly cute, the carapace of hardened New Yorkers would shatter the minute he pranced into sight. It always amused me when some hulking, thuggish character I would ordinarily have crossed the street to avoid, would run up to my dog and start talking to him in a high-pitched, squeaky baby voice. In Riverside Park we would sometimes sit with a white-haired lady in a wheelchair, who would take him onto her lap and stroke him and talk in a thick German accent about her own long-since deceased white poodle. He was the star of Morningside Heights, recognized and beloved by all. People were always stopping me to ask in all seriousness whether he was real or just a remarkably convincing mechanical toy. He was so small he fit in the very large pockets of my coat and I was able to take him with me everywhere I went. Once I took him to Butler Library stashed in my duffel bag. When I took him for walks, his tiny legs would be a blur as they would rapidly pitter patter down the sidewalk. He walked with absolute confidence, busily looking left and right as he surveyed his domain. You could almost hear the jaunty little jingle playing in his head as he walked: “This is my neighborhood. I’m going for a walk.” Whenever people approached to pet him, he’d leap up on his hind legs and pirouette joyfully. You could tell he was surprised, and just a little bit offended when people walked past him, without stopping to give him the adulation that was so obviously his due. Princely as he was, he seemed unfazed by the squalor of my miserable, dingy roach motel room and I think it is only because of him that I scraped through that personal annus horribilis. 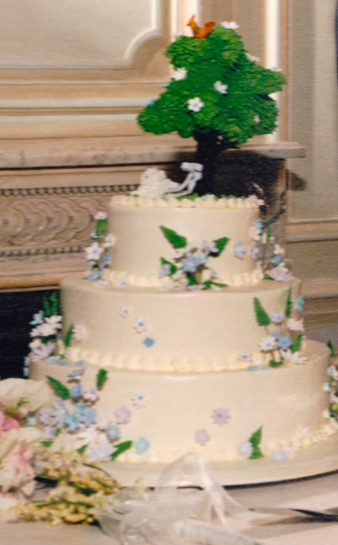 When my husband and I got married, our little dog made a cameo appearance atop our wedding cake. He began to lead a much quieter life when we moved to Charlottesville, Virginia. Gone were the urban throngs of admirers he had grown accustomed to greeting benevolently on his daily royal walkabout. And then, there was the arrival of a usurper to his throne. In photographs of the shower for my first baby, you can see the dog glued to my side, looking a little wary. Our son adored the dog, and found everything he did charming and amusing. The feelings weren’t mutual, but the dog tolerated his presence. What he couldn’t tolerate was being left at home by himself. In Manhattan you could take a dog just about anywhere. In the suburbs, there were very few places you could take a dog. Worse still, my husband and I had to be away from home for long hours. He chewed up all the door jambs and the carpets around the door through which we exited and entered the house. Our kindly neighbors, most of them elderly retirees, would hear him barking all day long, and then gently report to us that he seemed a little upset when we went to work. It was o.k., because we owned the house that he was slowly but surely gnawing to pieces, and because we had magnanimous neighbors. It all went terribly awry when we moved to Princeton, New Jersey for my husband’s sabbatical year. We rented out a cottage so tiny my mom refused to refer to it as anything other than “the dollhouse.” Worried that the dog would chew the house to matchsticks, we had planned to put him in Otto’s old crate whenever we left the house. We went out to dinner on the first day we arrived. As we walked back to the house, a neighbor came running out to meet us. I thought he was coming to introduce himself. Instead, he launched into an apoplectic diatribe punctuated with flying spittle flecks about strict town ordinances governing nuisance barking. 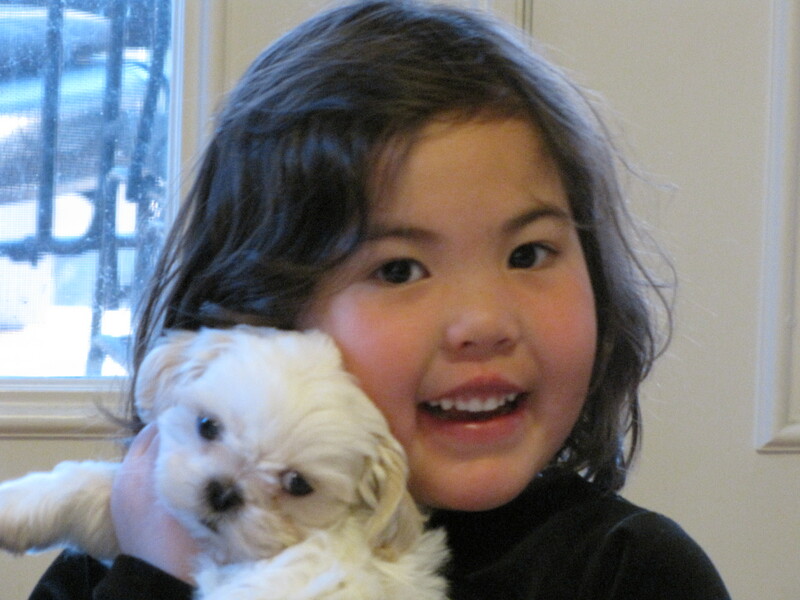 We began to take the dog everywhere we could, but most of the time I was trapped at home with an antsy toddler and a dog that was growing more neurotic by the minute. The few times we did leave, for an hour at the most, we would return to find that he had peed and pooped in his crate and had then rolled around in the mess. I was in the first trimester of pregnancy with my second child at the time, and was already feeling generally queasy. Cleaning diarrhea off the fur around my dog’s mouth was not helping the situation at all. As the stress mounted in our excrement-filled dollhouse prison, Colin and I started bickering like a couple of fishwives. When it became clear that the situation was untenable, we contacted a Maltese rescue society and working with those diligent matchmakers, we were put into contact with a couple who sounded too good to be true. Ben had taken early retirement because he had MS and was more or less housebound. He and his partner Darren already had a Maltese named Beauregard and they wanted to find a companion for him. We agreed to bring our dog over to meet them at their apartment in the Flatiron District. The men showed us around their apartment. They opened the door to one of two bathrooms. There was newspaper spread out all over the floor. I thought he could, as he was already trained to use a domed kitty-litter box, but I expressed my concern that he still raised his leg to pee. “Oh, that’s o.k.,” he responded lightly, “The housekeeper takes care of it.” As we continued the tour of the apartment, we couldn’t help noticing that it was essentially a temple devoted to the worship of the very worthy, exquisitely lovely, becomingly modest and sedate Beauregard. There were oil paintings and studio portraits of him everywhere. Ben explained, “We don’t have to worry about college tuition, so this is how we like to spend our money.” There were doggie stepstools around the beds and couch. A groomer came once a week to the apartment to coif their pooch’s magnificent full coat. They personally cooked chicken, rice, and the occasional vegetable for Beauregard every night. I thought that maybe my overly bouncy, somewhat scraggly dog might not be what they were looking for, but they were so smitten with him that they wanted me to leave him with them right there and then. I hesitated. I thought this was just a blind date. I hadn’t prepared myself. Colin shot me a look, the kind of look you’d give to a beggar who just won the lottery and then decided not to take the money after all…I burst into ugly, racking, deeply embarrassing sobs. Snot was running from my nose like water from a faucet. They patted me on the back, promised I could visit whenever I wanted, as they hustled me out the door. One year later I visited my little dog, who had been renamed Pookie. That whole year I had been haunted by the worry that my poor dog was spending his endless days and nights pining for me. I envisioned him waiting sadly by the door for me to return, his heart leaping and then falling every time the door opened and someone other than me walked in. When I did finally walk into the apartment a year later he came over to greet me politely, but then rushed back to jump into Ben’s lap. Slightly embarrassed by this less than ebullient reception on Pookie’s part, Ben brought him over to me and with sensitive generosity placed him in my own lap. Pookie leaped off and right back onto his rightful master’s lap. What Ben didn’t understand was that Pookie’s uncomplicated, total shift of loyalty was the best thing I could have hoped for. We still visit him every once in a while. He has reclaimed his title as Prince of All Manhattan, and is ensconced in a warm haven of luxury befitting his rank. In Ben, Darren, and Beauregard he found his fairy-tale ending and his true family. For many years after, we swore off all pets. As my son got older, his pleas for a pet became more plaintive. As a compromise, a couple years ago we dug a small pond in the backyard and stocked it with ten goldfish. The first couple of weeks passed like a long nightmarish déjà vu from my Aquarium of Death days. One after the other, day after day, the fish kept going belly-up. The first five or six deaths were traumatic for my young son. We gave each fish his or her own funeral service with all the pomp and circumstance due a 27 cent fish, who had been with us for all of a few days. Every day, our sad funeral cortege would wind its way to the part of our backyard where lawn meets woods. We would bow our heads and say a prayer for each of their departed souls, before giving them a proper Christian burial. The next couple of fish I flung to the base of a tree while my son and his brother were at school. As an afterthought I found a few dead leaves with which to hide the corpses so that the kids wouldn’t find them so heartlessly discarded. Today only one hardy fish survives: a now huge red comet, named Hobbes. While all of his former fellow pond-dwellers had lives that were “nasty, brutish, and short,” Hobbes lives on, the king of his watery realm. Which brings me, at long last, to the rabbits…Let me be honest. Foolish as it must seem, given my history, what I was really hankering for was another dog. But after all the sturm und drang with Pookie, my husband practically made me sign a contract in my own blood promising never again to have another dog. I began to cast about for other options. 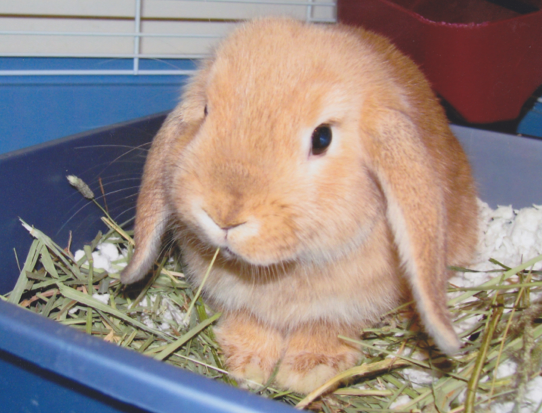 I happened to see a photograph of an inordinately cute bunny on some brochure. A few idle moments (so dangerous! ), a little innocent websurfing (in those vulnerable late-night hours), and the next thing I knew I was calling the nearest rabbit rescue organization about a funny-looking rabbit with a Groucho Marx mustache I had seen on their website. So desperate is the rabbit rescue organization to find homes for the many rabbits they care for, a couple days later, before I had a chance to come to my senses, a representative drove three hours from Laurel, Maryland to Charlottesville, Virginia in the middle of the night to deliver the rabbit to us. She arrived at eleven p.m. and immediately set to work constructing a cage with parts she had brought with her. It was well past one a.m. when she was finally done. She gathered the rabbit up into her arms, lovingly kissed the top of his head, whispered a benediction into his ear, and gently lowered him into his new digs. And just like that, we were in possession of a black and white English Spot, we named Alasdair. She turned to me with moist eyes and told me what a wonderful thing I had just done. I was a little confused. After all, I had merely sent an email enquiry in a moment of weakness and then sat by watching as this woman, who had just driven three hours, (stopping off to pick up food and litter for her charge), spent another two hours building a cage. She was about to drive another three hours, not to return home until four am. But she made it sound like I really was Mother Theresa, (hadn’t I suspected as much all those years ago when I had almost saved poor Charlene Tilton?). My place in heaven was assured thanks to my enormous heart. We went to bed that night with tears streaming down our faces. No, it wasn’t the raw emotion of having performed such a noble act in opening up our hearth and home to a creature in need…It was our immune systems kicking into high gear, revving up for the full frontal assault of rabbit hair and dander flying through the house via the air ducts. The next morning I bought an air purifier and parked it in front of the cage. Seduced by all those YouTube videos, I had envisioned a rabbit who would give us bunny kisses, do a few binkies around the family room, and then flop down on the couch next to us to watch t.v. I realized now that with our allergies, this was not to be. We nevertheless mounted an intensive campaign to befriend Alasdair through the bars of his cage. He wanted to have nothing to do with us. He would skulk in a corner and when we reached in to pet him, he would hop post haste to the furthest reaches of his capacious four by four by four foot cage, where it was virtually impossible to reach him. We kept them separated until both were neutered and then conscientiously followed the detailed bunny bonding techniques outlined in the instruction manual the rabbit rescue lady had left with us. My heart was madly hammering as we introduced them to each other. Fur flew and by the end of the bunny version of an ultimate, no-holds barred, smackdown, both rabbits were soaking wet from the water I had to squirt at them to separate them. After a few more catastrophic attempts to get them to tolerate each other, I resigned myself to having two lonely rabbits in two gigantic cages that took up almost all the floor space in our dining room. Although the situation was not ideal, we had come to terms with it. My husband very graciously refrained from giving me “I told you so” lectures. I know it took every ounce of self-control he could muster. And then one day recently, I discovered that Raphael had suddenly sprouted tusks from his mouth. As I looked more closely, I also noticed that his upper incisors were curling alarmingly backwards toward the roof of his mouth. One of the things you hear about rabbits is that they are cheap pets compared to cats and dogs, who need regular immunizations. What you don’t hear is that if they do require the services of a vet, you need to find one who specializes in “exotic animals.” I had to search high and low for a vet who could treat my extremely exotic rabbit and finally found one a few towns over. When I asked the vet to remove Raphael’s teeth, he demurred, telling me that if it were his pet, he would bring him in every couple of months to get the teeth filed down…to the tune of fifty bucks each time. I didn’t state the obvious. It wasn’t his pet. If it were, he could file them down himself, for free. The vet earned his fifty bucks, and I left his office reeling. Less than one month later, I saw Raphael’s lower incisors emerging again from his mouth like tusks. If I watched long enough, I could practically see them growing before my very eyes. I called the vet and asked him to give me a referral to someone who would be willing to remove the teeth altogether. In retrospect, I think he was punishing me for disregarding his professional recommendation by sending me to the Avian and Exotics Animal Hospital, where I sacrificed my kids’ college education so that Raphael could be liberated from his monstrous teeth. When I arrived at the clinic, the first thing I noticed was the large, sleek, black flat screen t.v. hanging above the reception desk. A slideshow of past veterinary patients played on a continuous loop. There was a bearded dragon being treated with acupuncture. A koi fish was lying on its side, hooked up to some kind of life support device breathing tube. Someone was syringing water over him, while someone else burned a tumor off his flank. I began to grow very uneasy. What deep inner circle of hell was this? When we were ushered into the exam room, the very competent vet had a quick look at Raphael’s tusks, and immediately agreed that they had to come out. She started briskly typing away at the computer to come up with an estimate for the surgery. I blinked a little when I saw 750 at the bottom of the screen. Surely this was some sort of mistake. Seeing me blanch, she assured me that there were things she “might be able to do” to lower the total. She went through the entire screen line by line until we reached the last item: precautionary preoperative bloodwork…50 dollars. “We could take this one off,” she offered. “Take it off,” I managed to choke out. 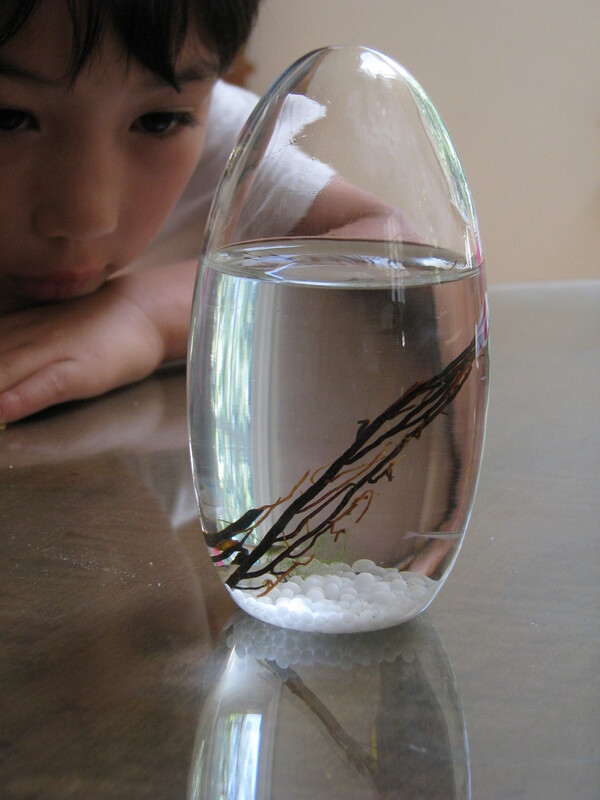 some sea monkeys who liked to lounge around their tank in velour track suits watching reruns on t.v., (how I wish I had taken a picture when they were alive!) and two murderous Roborovski hamster sisters who had to be separated before they killed each other. 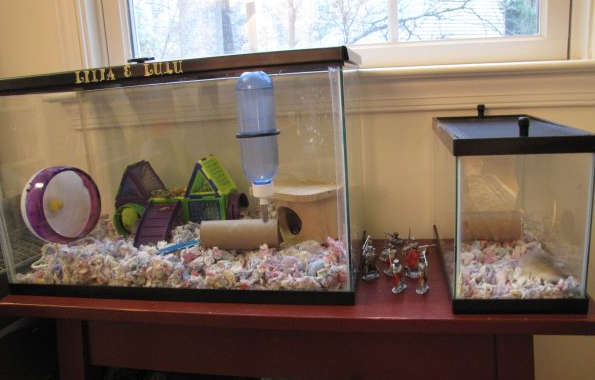 (Notice the knights my son set up by the temporary hamster jail we set up for the really aggressive one. And here I’d been imagining that they’d spend their lives chit chatting, doing each other’s hair, and exchanging makeup tips). 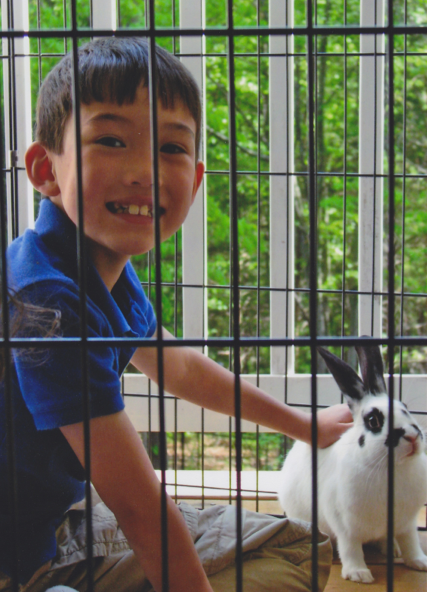 Alasdair and Raphael found a new home with people who show rabbits on the county fair circuit. Pookie died at a ripe old age and is memorialized in Madison Square Park with a plaque on the bench where he spent many happy hours. We now have two adorable, good-natured but rotten dogs, who like to pee on my couch whenever I turn my back. Hobbes, the comet, is still going strong.